There’s no secret in how to style short hair. However, to get the most out of your cut, you need to know some basic rules. All the styling is mainly focused on the top, whereas the sides are usually left untouched. Use the right product for every hairstyle. Otherwise, you can achieve a greasy and unpleasant look. You opt for neat and clean hair looks and have all the cards in your hands. But the idea of how to style short hair is still missing. Don’t despair! There’s some good news for you. We’ve collected the best short haircuts for men who value their time and want to look their best. We hope you’ll get inspired by the ultimate collection of the mens short haircuts because it can make or break your total look at once. Even though the mens hair cuts with a fringe may seem a bit feminine to you, this impression is deceiving. Everything depends on the way how to style short hair. What’s good about the short hair cuts for men with a fringe is that it is highly versatile. You can wear it short or long, geometric or asymmetric, wavy or straight. Such a subtle element as a fringe can make a huge difference to your short hair. So, don’t hesitate to try it! If a fringe is still too much for you, go for its alternative version, a quiff. It differs from the fringe in the way that the former kinda looks down whereas the latter looks up. With a quiff, your short haircut will have an air of a retro style. It came to us from the 1950s, when the Rock ‘n’ Roll King Elvis Presley popularized it. However, today men hairstyles have many different modifications, which helps to adapt it to modern times. Take your favorite pre-styler, for example, a voluminous mousse. Spread it all over your hair. Set the blow dryer to the medium temperature so that it won’t damage your hair. Blow-dry your locks to your “better-looking” side. To add more volume, you can blow-dry it several times back-and-forth. As soon as your hair is completely dry, scoop a bit of your trusty hair styling product, like a hair clay, wax or pomade. Rub the product between your hands to warm it up a little. Apply it to the top hair, starting from the back and moving forward to the front. Style your quiff up to the “best” side. To give the look a little messy attraction, grab some more styling product and pierce together the hair at the side parting. If you’re looking for more breezy short hairstyles men with a quiff would do, here’s a simple alternative. Skip the blow-drying part as well as the pre-styling product. Brush your fingers through the quiff and style it to the “best” side, creating a light wave. To finish the look up, pierce the hair at the front with your fingertips. 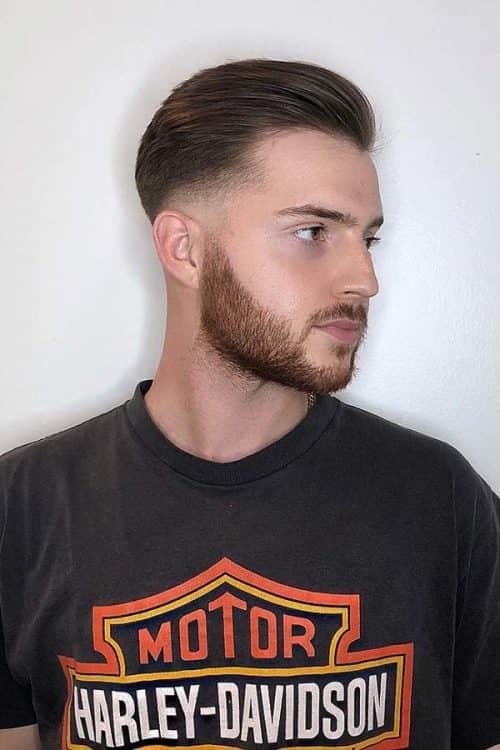 Is High And Tight The Most Comfortable And Simple Haircut That I Can Try? This butch cut is one of the most popular and attractive short haircuts for men. It belongs to low maintenance mens hair cuts and the ones that boost the masculinity of the look. Even though it doesn’t require any special styling, the touch of a hair product wouldn’t hurt. Rather, it would help to tame any flyaways. Another popularized by Elvis Presley men’s haircut is the pompadour or simply the pomp. 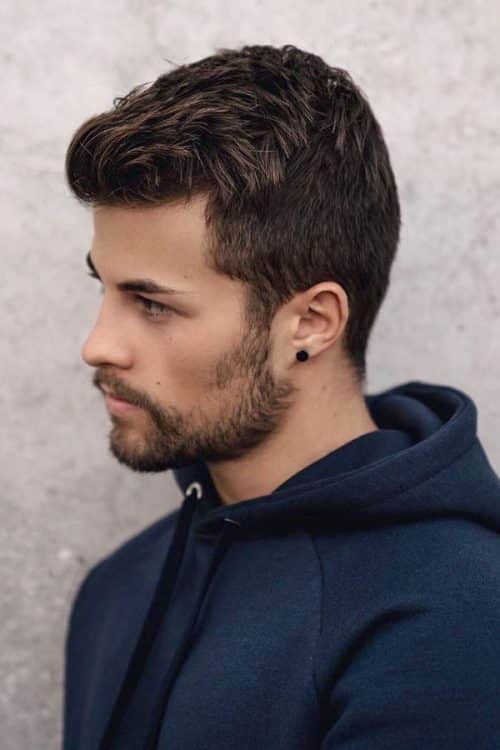 To get the hairstyle, the top hair should be much longer than the side and back short hair men usually have buzzed cut. If you’re wondering how to style the short hair pompadour, simply keep reading. First and foremost, you need to wash your hair. Towel-dry it to soak the excessive water. Apply some pre-styling product with the heat protection. Blow-dry the pomp to the side that looks best on you. Take some hair styling product, like a cream or pomade, and spread it all over your hands. Run your fingers with it through the top of your hair and rub through until your hair is textured. Looking for some easy hairstyles for short hair? We have a great option for you. How about giving yourself the high and tight haircut? It’s very easy to achieve. Just shave the hair on the sides and back and leave it longer on top. Keep in mind that the crown should be of equal length though. 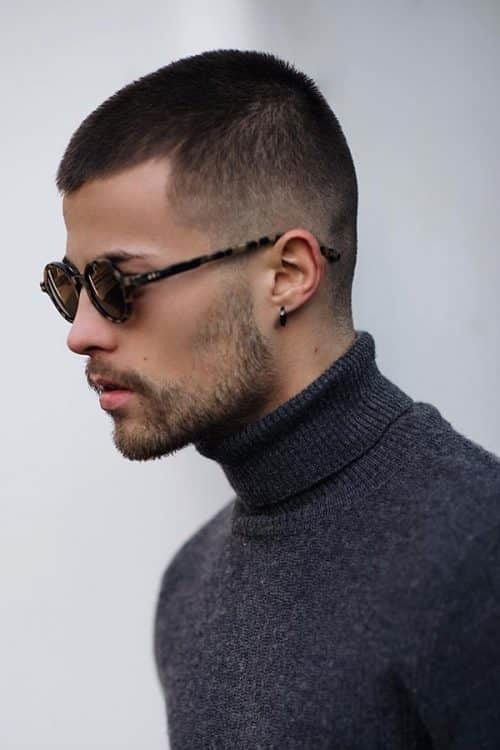 As for some additional hair ideas, you can style you high and tight with a low surgical part or a line-up. Dip your finger into your go-to hair styling product. Ensure that all your hands are covered with it. Apply the product to your crown, moving towards the back. Run your fingers through the top of your hair. Use the fine-toothed comb to slick the hair back. Help yourself with the other hand to place the hair where it supposed to be. Men hair allows as many versatile layered short haircuts as you can only imagine. Don’t worry, we’ll shed the light on how to style short hair with an undercut. Apply some of the pre-styling product to your previously washed and towel-dried hair. Blow-dry your locks, moving front to back. Use a comb with fine teeth to pull the hair back until it’s smooth. Press your man haircut into place with your palms, moving from the sides to the top. Check out the look into the mirror and tame the flyaways if there are any. And—bam! You’re rocking the hairstyle men with the exquisite taste would highly appreciate wearing. 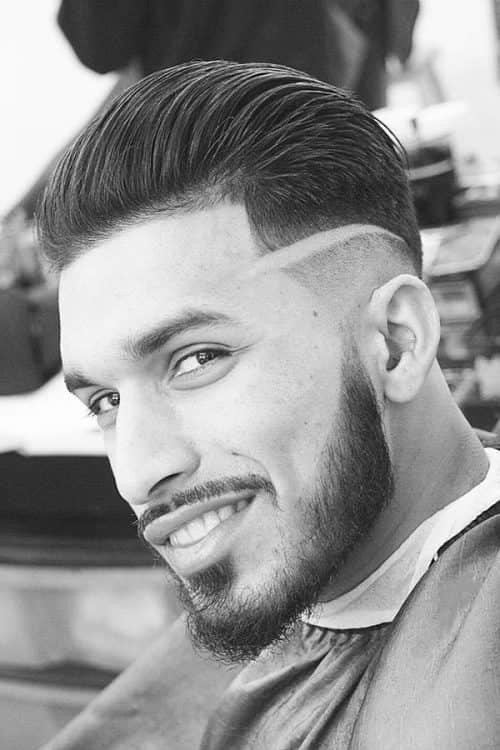 The tapered fade cut is among the leaders of the most popular haircuts for men. 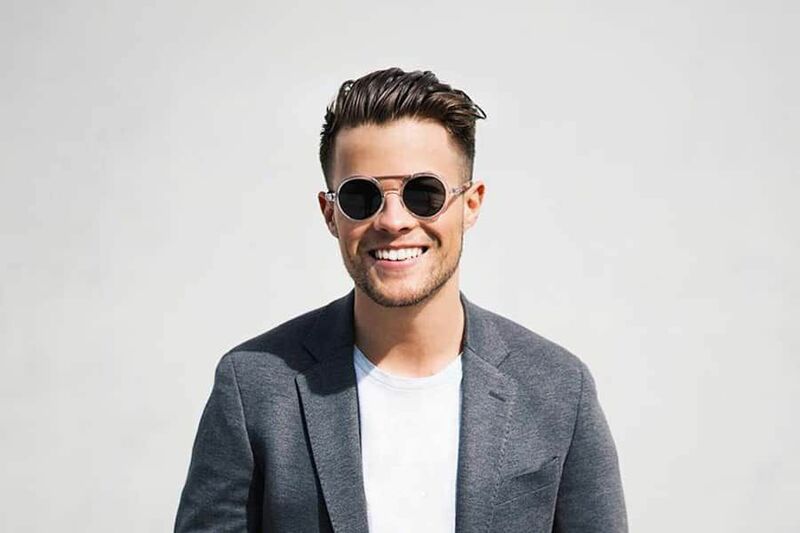 To achieve it, you need to create a gradual transition from the longer to the shorter hair on the sides and back of your head. As for the crown, however, you can basically try any variation of the top mens short haircuts. 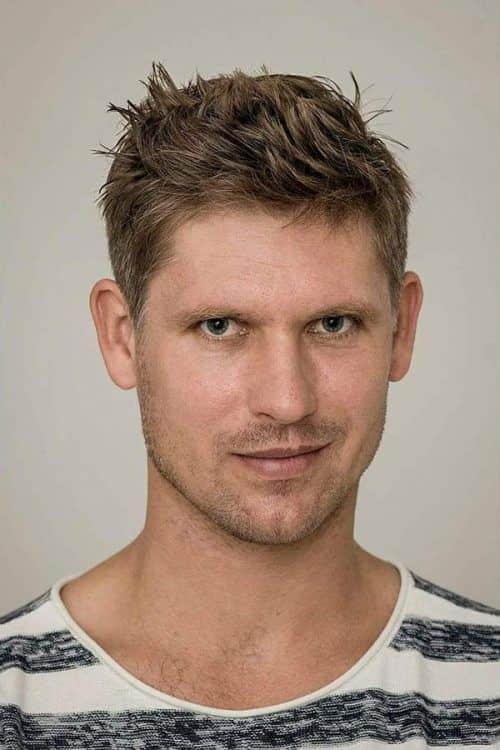 Guys with a strong jaw and square face shape would find this haircut exclusively flattering. What else is good about a taper fade is that being a short haircut, it works great on any hair type. So, no matter what kind of hair you have, feel free to ask your barber for a nice tapered fade cut. However, don’t try to trim this haircut at home as it requires the special skills. What you can try at home is styling. Product-wise, go with the water-based product, such as pomade, because it won’t give you a greasy look. Talking about styling the tapered skin fade short hair cut, we’ve already prepared a detailed manual for you. Pre-wash your hair and dry it with a towel. Apply a bit of the pre-styling product to the crown. Blow-dry the hair, moving from the forehead to the nape. Use a brush for some additional volume. Take a sheer volume of the styling product with a finger. Spread it evenly across your palms and fingers. Start by applying the product to the hair on top of your head, using your fingers and palms and moving front to back. Work the product in with a flattened hand at the side sections. Give your short haircut for men a natural look with the help of the fingers. The short spiky hair looks amazingly hot and steamy. So why don’t you give it a try? Primarily, it’s based on the taper cut, which is one of the trendy haircuts with longer top and cropped hair on the sides. Just apply some hair styling product to the crown and create a spiky finish through the edges by twisting some random strands with the fingertips. 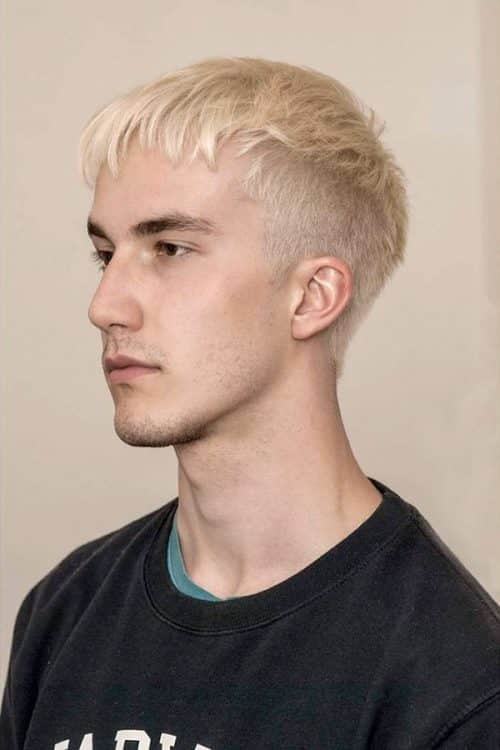 We hope that after giving you some cool ideas on how to style short hair men cuts, you’ll manage to decide easily on the hairdos you’d love to try. Having a ton of advantages, short haircuts remain one of the most requested styles. High five if you can’t wait to pull off the look you’ve chosen.